The system which sees private firms monitor criminals serving community sentences is "irredeemably flawed", the chief inspector of probation has said.In her final annual report, Dame Glenys Stacey said people would be "safer" if supervision of offenders in England and Wales was back in public ownership.Probation services were part-privatised in 2014, allowing firms to monitor low and medium-risk offenders.Justice Minister Rory Stewart accepted "the current model is not working".At the end of September, a total of 258,157 offenders were on probation in England and Wales, either preparing to leave jail having just been released, or serving community or suspended sentences. 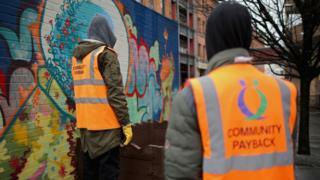 More than 150,000 were supervised by private Community Rehabilitation Companies, with the rest - deemed high-risk offenders - managed by the National Probation Service.But Dame Glenys said eight out of the 10 firms inspected since January last year were rated "inadequate", while public services were performing better. Her report reveals that one firm, Sodexo, holds meetings between offenders and probation officers in restaurant-style booths in open-plan offices. Artificial background sounds, known as "white noise", are played to prevent people from eavesdropping.Dame Glenys, whose tenure as chief inspector ends in May, criticised the shake-up of probation carried out five years ago under then-Justice Secretary Chris Grayling. "Above all, it has proved well-nigh impossible to reduce probation services to a set of contractual requirements," she said.Meanwhile, the number of probation professionals is at a "critical" level, with too much reliance on unqualified or agency staff.